Cole Imperi How Do You Want to Be Remembered? Poet Elese Daniel spoke for our October theme of HONESTY. 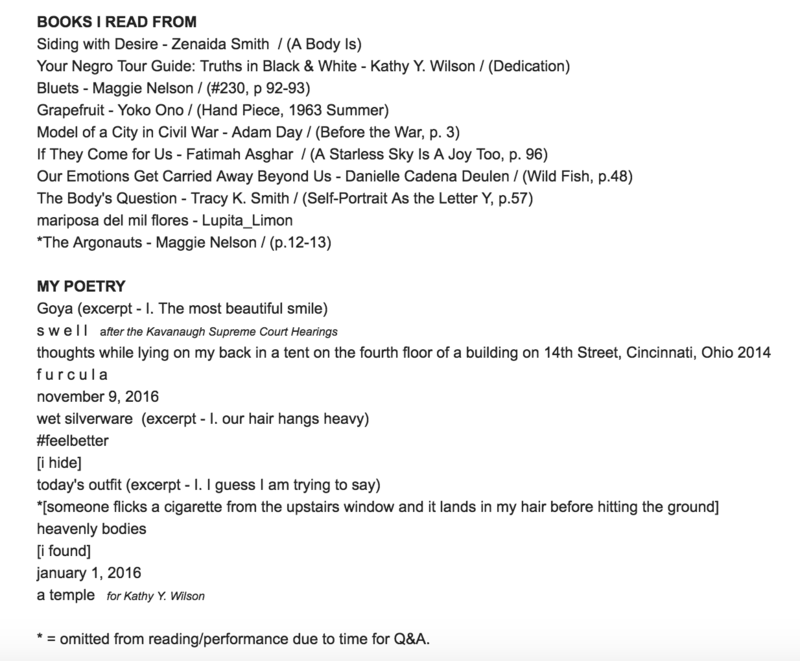 As requested by the audience, here is a list of poems she read - both her own and other authors’ poems. 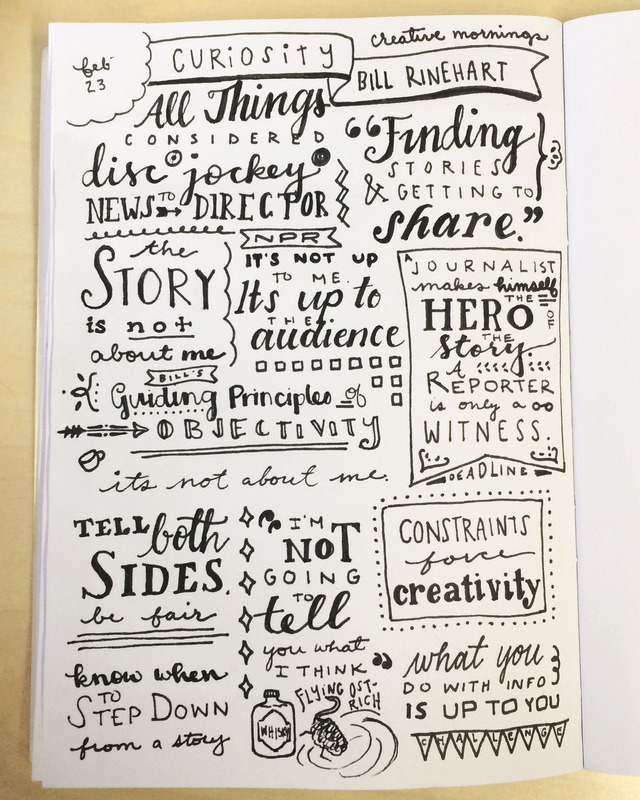 Notes as #illustration. Lydia Reagan designed this magical page while designer Tommy Sheehan waxed poetic on the theme of Craft. The CreativeMorning Cincinnati crew gathered at Rhinegeist brewery in Cincinnati to hear him speak. 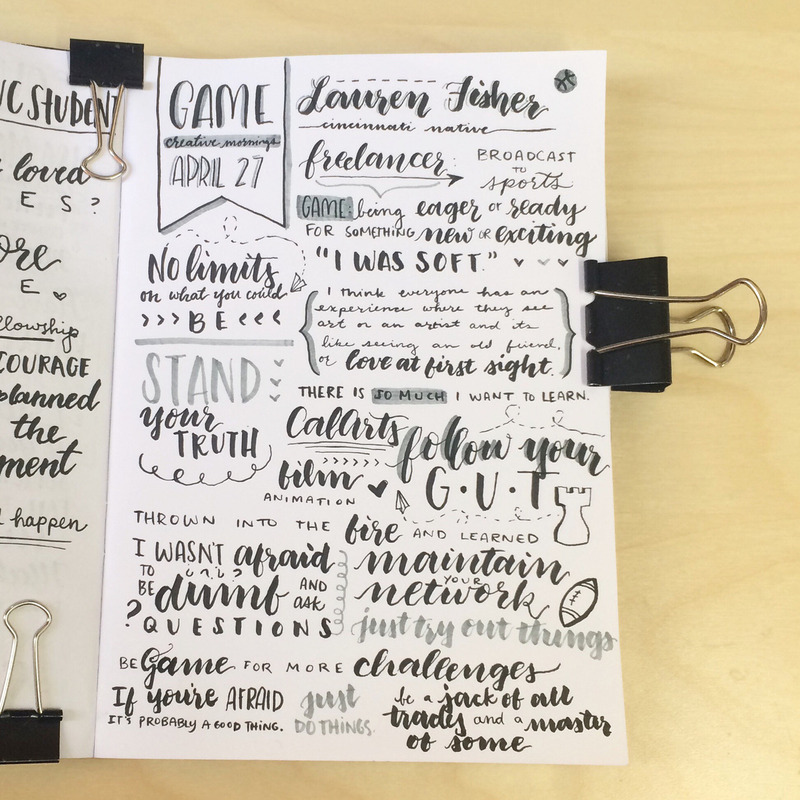 Design notes from our charismatic and wonderful March speaker, Lauren Fisher. Lauren is a motion designer who works with the NBA, NCAA and NFL shared her work and inspiration with us. 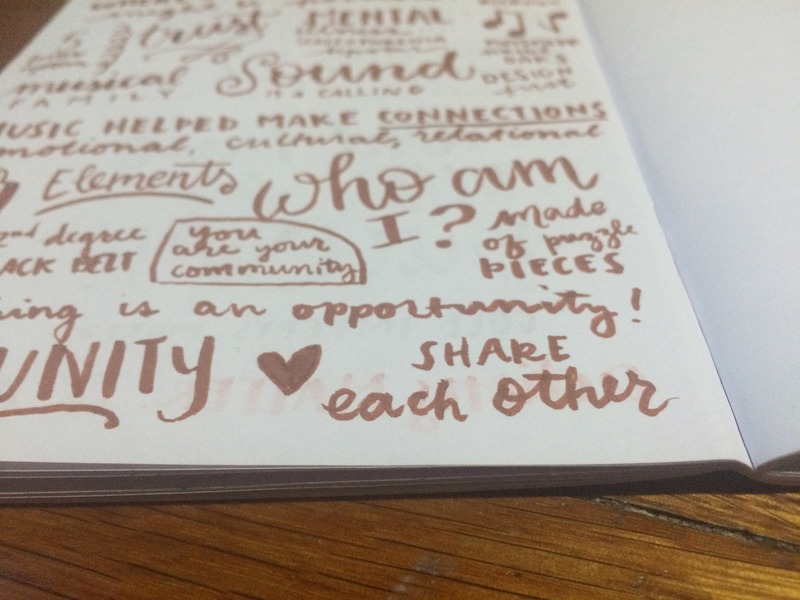 Handwritten notes created by the amazing Lydia Reagan. 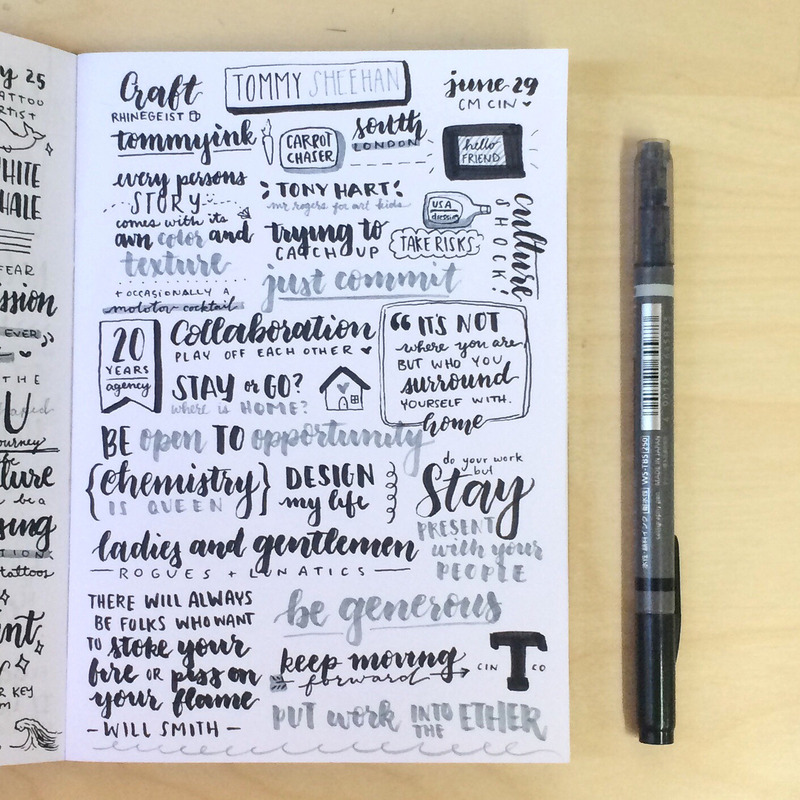 Note art by one of our CreativeMornings designers, Lydia Reagan. “New year, new me.” Depending on your perspective, that mantra can be empowering, intimidating, or just delightfully ironic. The new year brings determination, but also uncertainty as we take on challenges and personal goals. As we face what’s to come in 2018, we’re going to talk about ANXIETY. How to recognize it, cope with it, and what to do for others who are feeling the world spin a bit too fast. 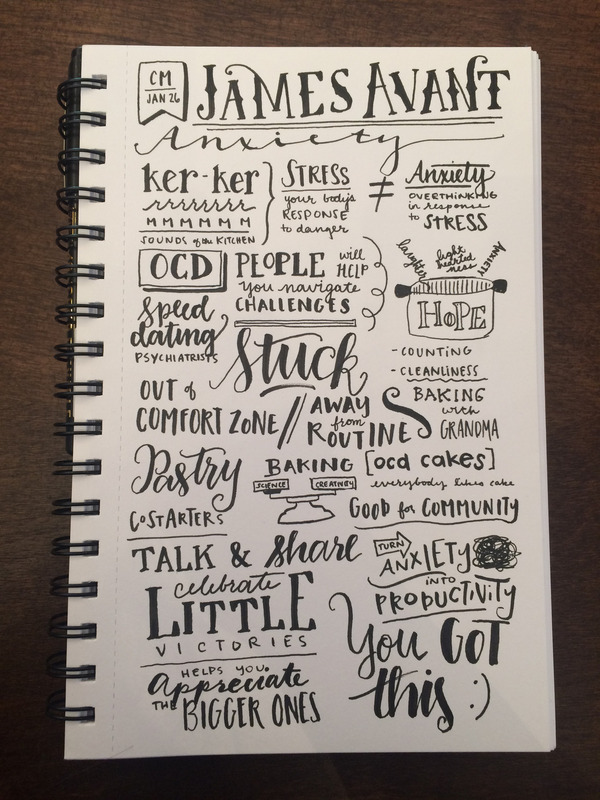 James Avant IV, founder of OCD Cakes, was diagnosed with obsessive compulsive disorder while he was studying neurobiology at the University of Cincinnati. While seeking treatment, he used the baking skills his grandmother taught him to make elaborate cupcakes. Soon, his side hustle turned into a business, and he started OCD Cakes, which stands for Obsessive Cake Disorder. James uses his business as an opportunity to talk about mental health, finding his own path, and the continual journey of working with whatever life serves you. Please join us to hear from James and taste some of the baked goods from OCD Cakes. Can all notes look like these notes? 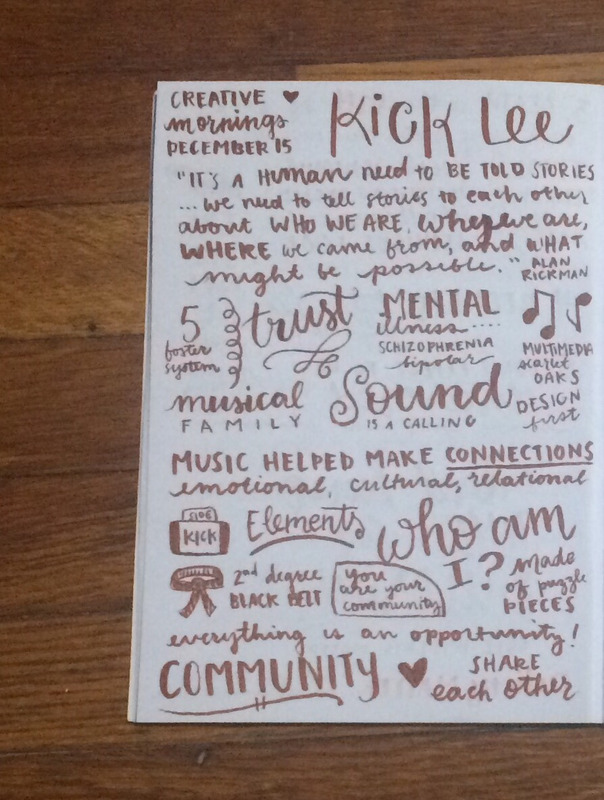 Lydia Reagan, designer and CreativeMornings/Cincinnati volunteer, illustrated her takeaways from Kick Lee’s breakfast lecture. Beautiful! Longform - Interviews with exceptional longform writers. Max Linsky, can we be best friends? Heaven’s Gate - Yes, that Heaven’s Gate. Not for the faint of heart, but for those who are fascinated with cults and psychology. Hidden Brain - Psychology for the real world. Code Switch - About race, culture and identity in America. The Leavers by Lisa Ko. Beautifully written, dynamic and realistic characters, highly relevant storyline. How Spotify bots are learning what music to recommend by tracking what we listen to, how long and what songs we skip. How’s that for context to your musical preferences? Farnam Street Blog which helps people master what others have already figured out about life. Topics include emotional intelligence, health and scheduling your time. Cool Hunting is nice for all your trend-hunting moments, when you want to understand where things are going and how your ideas stack up against trends. We’d call this site a brain tickler. Find wonderful and random things, including food, events, art and architecture, on Atlas Obscura. Context is an underused word for an abstract concept, and it’s the theme of our December breakfast lecture. Context is personal. Who are you without the context of your familiar, your job, your background or your friends? You are an individual, but without the context of others you may not feel so well-defined. And when you travel to another country or enter the context of another culture, do you feel your individuality or differences all the more acutely? Or do you feel more of a sameness and similarity? Context can be big and small. Its your personal frame of reference and the bigger picture. It’s what we hold others against and how we perceive ourselves. Without context there’s a lack of understanding. With context, there’s connection.